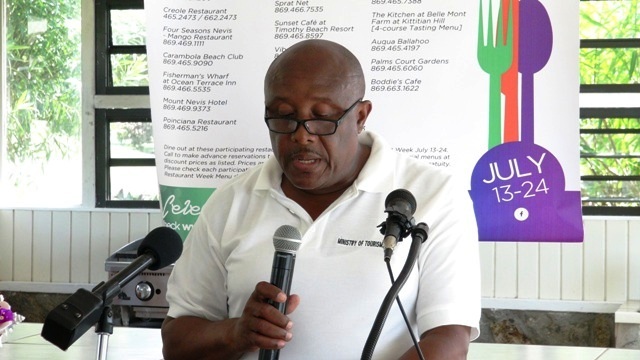 NIA CHARLESTOWN NEVIS (July 20, 2016) — Permanent Secretary in the Ministry of Tourism Carl Williams, commended the 11 restaurants on Nevis for participating in the ongoing St. Kitts and Nevis Restaurant Week 2016. 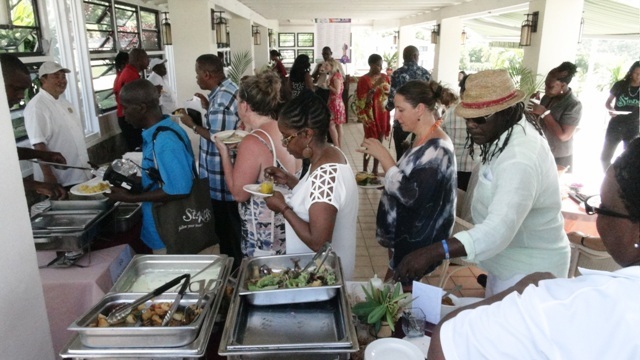 Williams who was at the time delivering remarks at the St. Kitts and Nevis Restaurant Week Tasting Showcase at the Mount Nevis Hotel on July 15, 2016, said although Nevis participated in the event in 2015, the increase on the level of participation this year is a dramatic improvement. This year’s participating restaurants on Nevis are the Nevis Plantation Beach Club, Montpelier Plantation, Oualie Beach Resort, The Hermitage Plantation Inn, Oasis Restaurant at The Botanic Gardens, The Gin Trap, Four Seasons, Nevis Mango Restaurant, Mount Nevis Restaurant, Golden Rock Inn, Sunshine’s Beach Bar and Grill and Boddies Café. St. Kitts and Nevis Restaurant Week 2016, commenced on July 13 and concludes on July 24, 2016. During the week, special menus are being offered at restaurants on St. Kitts and Nevis at discount prices, celebrating local cuisine with pumpkin as the featured ingredient. The Nevis Island Administration (NIA) through the Ministry of Tourism endorsed the event, since its primary objective is to grow business during the low tourism season. According to Williams, the tourism industry in St. Kitts and Nevis is marked by extreme seasonality and a key aspect of the strategic plan of both the Ministry of Tourism on Nevis and the Nevis Tourism Authority is to attempt to lessen the impact of the off season. “On average approximately 70 percent of Nevis’ tourism revenue is generated during the high season months from November to April, which means that only about 30 percent of revenue trickles in during the slow season from May to October,” Williams said. He added that the introduction of events such as the Nevis Blues Festival in May and the Nevis Mango Festival in July, there is some degree of success in coping with the uneven distribution of tourism earnings. They have also redoubled their efforts in promoting Nevis’ summer festival Culturama to visitors and the nationals in the diaspora. Williams believes that the off-season events make the destination more appealing in the low season and stimulates much needed visitor expenditure. Assistant Secretary in the Ministry of Tourism John Hanley, who chaired the event said restaurants are a critical component of the visitor’s experience. “Our dining scene is as diverse as it is delicious, from the chandeliers of the upscale Four Seasons Resort to the relaxed casual atmosphere of Sunshine’s Bar and Grill, from fillet mignon to fried fish. “One only has to take a look at Trip Advisor to see the rave reviews of our fine dining establishments which are extolled for their use of fresh local produce, superlative customer service and the high quality taste of their offerings,” he said. Hanley also pointed to the important linkage formed with tourism and agriculture and described it as indispensable. He said the more one ate local produce, the healthier they would be and the more revenue would be retained in the island’s economy. 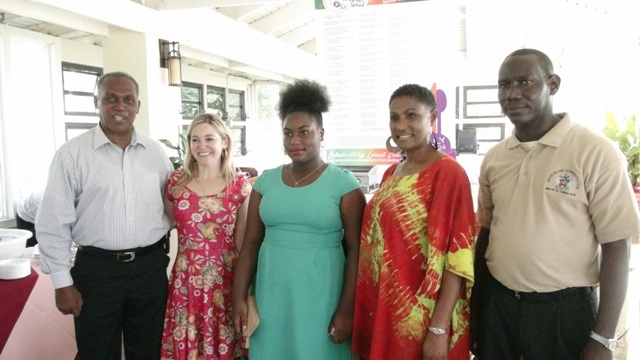 Other remarks came from Jeanette Grell-Hull, Manager of the Mount Nevis Hotel, Permanent Secretary in the Federal Ministry of Tourism Carlene Henry-Morton, Coordinator of Restaurant Week Kathleen Pessolano and Permanent Secretary in the Ministry of Tourism on Nevis Eric Evelyn. Among those present were Premier of Nevis Hon. Vance Amory and Novelette Morton, Senior Projects Officer and Allister Williams of the Tourism Events Unit both in the Federal Ministry of Tourism.